Fatou Mandiang Diatta, aka Sister Fa, was born in April 1982 in Dakar, Senegal. She records her first demo-tape in 2000 when she is still a teenager and women still didn’t rap in Senegal. A mere year later, she’s invited to perform at the Senegalese Hip Hop Awards. 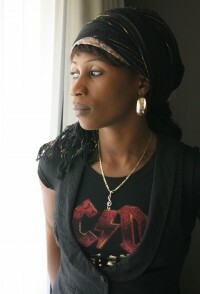 In 2002, she participates in a music compilation, Art City, with French and Senegalese rappers; and represents the Senegal at the Festival de rap feminine international in Guinea Conakry. In 2003 she joins the Senegalese label FN’F (Fight n´ Forget) where she participates on several compilations, including the AIDS-focused Tous Rappons le Sida, continuing her commitment already expressed in her own songs to talk about serious issues in her music. In August 2005, her highly anticipated debut solo album Hip Hop Yaw La Fal is released. Her hard work is instantly recognized four months later at the Senegalese Hip Hop Awards, where she is named Best Newcomer of the Year. Sister Fa uses her growing popularity to heighten consciousness about social and political themes, focusing on women’s rights in Senegal. In March 2006, Sister Fa moves to Berlin, Germany, to live with her husband Lukas May, an Austrian ethnologist and documentary filmmaker. It’s a challenge to build her career fresh, but she’s soon making music again with a new band of German musicians. One of her songs Selebou Yoon appears on Many Lessons, a compilation exploring the intersection of hip hop and Islam released by Piranha Records. Pretty soon, she’s playing concerts throughout Germany and Eruope. With her current band of professional jazz musicians, traditional Senegalese rhythms are combined with rap beats, soul, jazz and reggae elements. In May 2009, He re-releases her debut album in Europe as Sarabah: Tales from the Flipside of Paradise together with the help of Initiative Musik. In 2008, Sister Fa turns her attention to the fight against Female Genital Cutting in Senegal, and she launched a tour called Education sans Mutilation, with appearances in Dakar and Kaolack. In 2010, with the modified name of Education sans Excision, she and her band return to Senegal and begin to bring her music and her message to areas in the south with deeper links to the tradition. She is currently working on initiatives to bring more musicians from Senegal and other countries in West Africa into the fight.